Patna: The issue of Telugu Desam Party pulling out from NDA government over the denial of special status to Andhra Pradesh was lapped by RJD chief Lalu Prasad and his son Tejaswi Yadav as they attacked Bihar Chief Minister Nitish Kumar for “surrendering state’s benefits for personal gains”.Launching a blistering attack on Mr Kumar through his official Twitter account, Mr Prasad said, "Why Nitish not asking his boss to accord special status to Bihar? PM Modi had promised special status to Bihar in March 2014 Lok Sabha election rally at Muzaffarpur. Nitish must play that speech recording in front of PM. 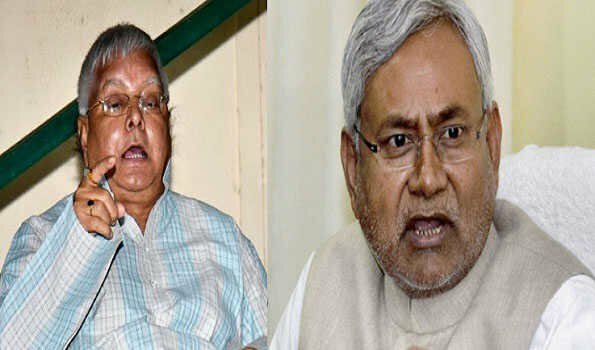 For personal gains Nitish surrendered Bihar’s benefits”. Mr Prasad had already announced before his imprisonment in yet another case of fodder scam that he would continue to remain in touch with people through social media by giving message to person handling his Twitter account during period of jail term.In the same vein, Mr Prasad`s son and Leader of Opposition in Bihar Assembly Tejaswi Yadav tweeted, “ Nitish Kumar must learn from Andhra’s CM N Chandrababu Naidu Ji. Nitish Ji is a spineless CM. He has mortgaged and sold his morality, conscience and politics to BJP due to fear of hidden CD and file”.